This work presents the centennial history of one of Ohio's premier public universities. Author William H. Hildebrand takes readers on an exhilarating and illuminating ride through Kent State University's ten decades: from its beginning under its visionary founder John Edward McGilvrey to the hardships of the Great Depression; through the post-World War II boom years and the tumultuous sixties culminating in the May 4, 1970, tragedy; from the university's struggle to regain its bearings during the decade-long aftermath, to its restoration and academic resurgence in the eighties and nineties; and, into the emerging opportunities and challenges of the new millennium. Complemented by scores of photographs, ""A Most Noble Enterprise"" features vivid portraits of the school's eleven presidents and their distinctive contributions to the university's character and development. Along with snapshots of changing campus culture and student life, Hildebrand details the ongoing attempts to define the purpose and value of a university education, the relation of undergraduate and graduate education in a public research institution, the evolution of important centers and institutes in the arts and sciences, and the place of varsity sports in a public university during the most recent decades. The interplays among faculty, administrators, students, town, government, and university are key themes that flow throughout this engaging history. With supple, witty, and sparkling prose, the author evokes the triumphs and follies and humor and pathos of this complex, diverse university in all their fascinating, colorful reality. 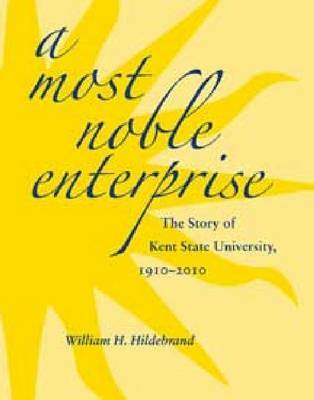 Long after the centennial celebrations and speeches have faded from memory, ""A Most Noble Enterprise"" will stand as a testament to Kent State's dedication to the ancient purpose of a university education - the advancement of learning.